That there is a growing need for legal services by a wide array of Kenyans and Corporates cannot be gainsaid. Key providers for the said Services are Advocates who as at 2018 were 15,400 with 8,000 in active practice. With Kenya’s current Population of 50 million, the above translates to an Advocate to Citizen raw ratio of 1: 3,247. In terms of absolute ratio, Kenya fares poorly in comparison to other countries including the United States of America which has a ratio of 1:300, while the United Kingdom has 1:401. A look at the above against annual total cases filed in the Kenyan Courts reveals that in 2015-2016 period a total of 465,792 cases were filed of which 75.69% were Criminal while 24.31% were Civil. In the 2016-2017 year, a total of 344,180 cases were filed in Kenyan Courts of which 75. 25% were Criminal in kind and 24.75% were Civil. The burden is exacerbated by a large portfolio of the backlog of cases in excess of 304,182 at end of 2017. Notwithstanding a neglible advocate to Citizen ratio and a growing caseload within the Kenyan Courts, it would be expected that average remuneration for Advocates in Kenya to be competitive due to the low supply satiating a surging demand. The above has however not been the case with reported cases for freshly admitted Advocates of the High Court of Kenya earning as low as Ksh. 12,000 per month. The above is way below the Ksh. 120,000.00 which is an average Market Salary for a Fresh Masters Graduate. It is worth noting that to be an Advocate in Kenya one must successfully undertake a Post Graduate Diploma in Law offered at the Kenya School of Law before seeking Admission as an Advocate of the High Court of Kenya. The above serves to underline a market gap both at the service offering level and resource utilization level within the Kenyan Market. One of the principal duties of an Advocate is to represent her client in Judicial and Quasi-Judicial Proceedings. The above is in addition to offering legal advisory services. In Germany and majority of other European Countries, it is mandatory for parties to be represented by Advocate in all proceedings. In Kenya, even though the right to representation is a constitutionally protected, it is only in some Capital Offences specifically Murder that Court shall not proceed without an accused person being represented by an Advocate either instructed by the accused or by the State. On the other hand, process servers are needed in an assortment of tasks such as filing court papers, serving legal documents, and document retrieval. Their principal job is to deliver or “serve” legal documents to a defendant or person involved in a court case. After serving any legal documents, process servers have to deliver actual evidence that the legal papers were served. The verification that is offered is referred to as an affidavit of service or proof of service, which must be notarized and given to the individual or company who required the papers to be served. Process servers are legally required to serve papers in the correct manner laid out by Law. In total Kenya has approximately 1,600 Registered Process Servers serving a Population of 50 Million which translates to a ratio of 1:31,250. It is worth noting that all Advocates of the High Court are by virtue of being officers of Court also Process Servers. An Arbitrator is an independent person or body officially appointed to settle a dispute. By Law, Arbitrators play a critical role in conflict resolution, an overarching objective shared by Advocates and Process Servers and therefore a critical player in the Justice Chain. Chartered Institute of Arbitrators is among few cognisable Professional Membership Organisation representing the interests of Alternative Dispute Resolution Practitioners. Currently, the Institute has members from such diverse fields as Architecture, Engineering, Quantity Surveying, Law, Insurance, Accounting and Property Valuation. To be an Arbitrator one must be certified by a professional body. Data on an actual number of Practicing Arbitrators is scarse with estimates ranging from 880 to 3,000 members. Patawakili is an Integrated Platform for all the above in the in the simplest way possible. We strive to give you affordable, comprehensive, swift and reliable solution to any of your Legal Service needs, on a single platform from the convenience of your home. Patawakili leverage on Technology to bring Legal Services to your doorstep and in your hand. With round the clock support from our Service Provider, who shall provide you their valuable opinion by understanding your exact needs, Patawakili shall help lay to rest your inhibitions about Disputes Courts and Law. With confidential consultations by Verified Service Providers in the industry, we ensure dependable legal services of the highest standards at all stages. Our services and forum are the storehouse of tremendous information that shall help you resolve complicated Legal Disputes, that are made to protect and empower us, in simple terms. For the Justice Chain Service Providers, Patawakili shall provide a Platform to truly dedicated the best of our profession to help the common man gain trust in the Legal System. Our platform allows you to reach out to a wider base of clients to build long-term Service Provider-client relationship. Utilizing our resources of Forum, Services, and FAQs, you can showcase your expertise and earn favorable reviews from our users. With over 45 million internet users in Kenya, Patawakili offers you this unlimited scope of technology and gives you the platform to directly engage with numerous clients on a single portal. We Leverage on Technology to create unique Reliable, Trusted and Efficient Market for Legal Services for All. 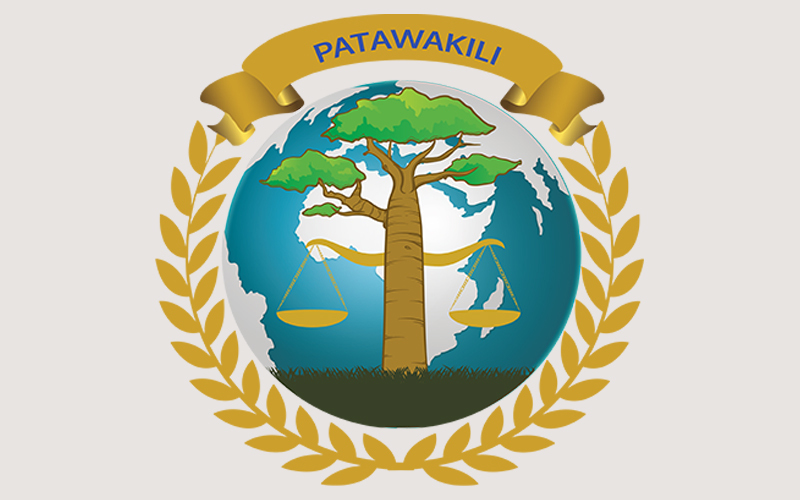 5.0 Overarching Objective of Patawakili. Patawakili is a Web-based Application developed using Progressive Web Application (PWA) technology that seeks to enhance access to Justice by both Individual and Corporate Persons in Kenya by providing an easy to use, convenient and adaptable platform. 10. 360 Degree reliable and Confidential Patawakili Service Star Rating System (PSSRTS) for review of quality of services. Patawakili is not an advertising medium for Service Providers. Sponsorship or Listings are not referrals or endorsement by the company. The company shall not be liable for any loss or damages that may occur to any person due to the advice received via the website or from our Service Provider. Patawakili shall not be liable for the use of any information available on the website by any person.